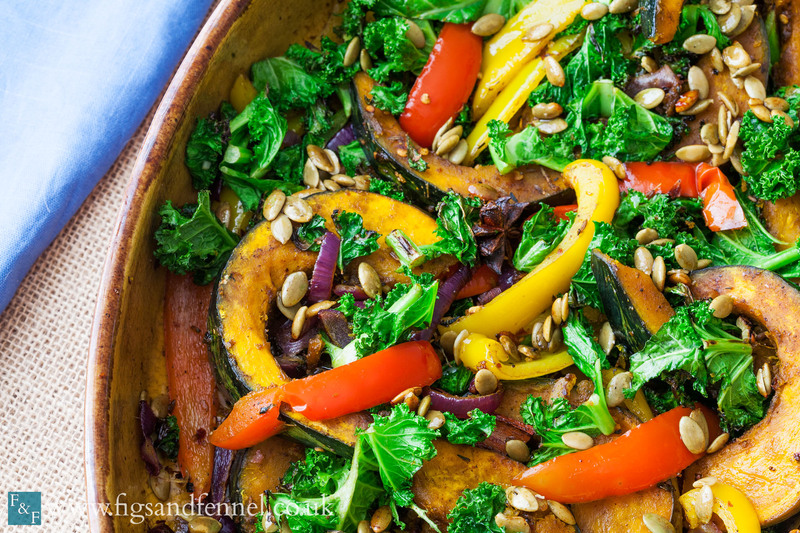 Bring the sunshine to your dinner table with this Caribbean inspired sweet and spicy squash and kale dish. I use kabocha squash, a round, winter variety with a dark green and orange skin. The cooked flesh has a floury texture, a bit like plantain and tastes sweeter than butternut squash. While the skin appears thick and tough at first it softens in the oven and adds texture not to mention fibre to the dish. If you can’t get hold of kabocha squash, butternut is fine but you’ll need to reduce the squash cooking time by 10 minutes. Cut the squash in half discarding the stalk. Scrape out the seeds the cut the squash into slices around 2 inches thick. Place the coconut oil on a large baking tray and pop in the hot oven for 30 seconds until it melts. Remove the tray from the oven and add the squash along with the star anise, chilli flakes, broken cinnamon sticks, all spice, cumin seeds, thyme, salt and pepper and stir so that the ingredients are combined and each piece of squash is coated with the oil. Place the tray on the middle shelf of the oven and cook for 20 minutes (or 10 minutes if using butternut squash). While the squash is cooking, peel the onions and cut into chunks. Core and de-seed the peppers and cut into chunks. Once the 20 minutes cooking time is up, remove the squash from the oven and add the onion and peppers to the tray. Toss in the oil and spices adding a little more oil if necessary. Return the tray to the oven for a further 20 minutes. While the vegetables are cooking, peel and chop the garlic. On a separate baking tray grease with a little coconut oil then combine the pumpkin seeds, agave syrup, lime juice and cayenne pepper. minutes before serving place the baking tray on the top shelf of the oven so the seeds can toast. Keep an eye on these and give them a stir and shake after a couple of minutes. In a non-stick frying pan add the tiniest bit of oil and fry the garlic for 30 seconds before adding the kale. Fry for around 3 minutes. Remove both baking trays from the oven. 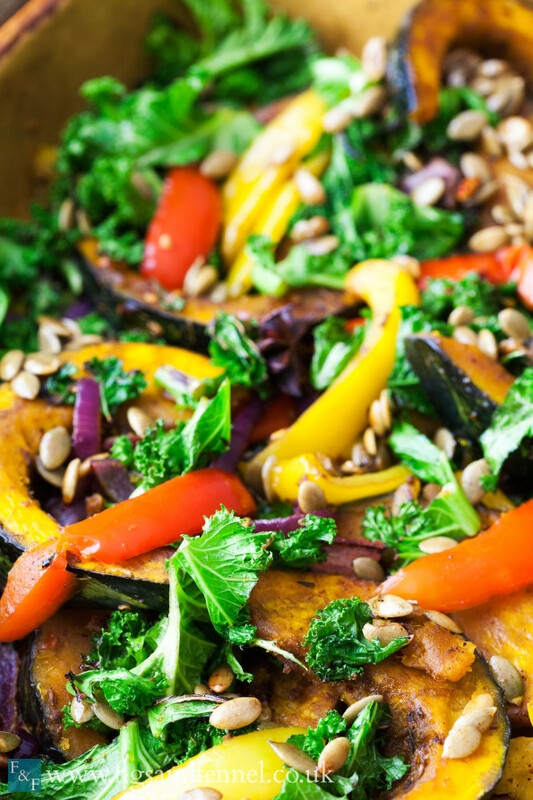 To serve, combine the kale and garlic in with the squash and other vegetables and sprinkle the sticky seeds over the top. Please let me know how it turned out for you! Leave a comment below and share a picture on Instagram with the hashtag #figsandfennel.